Guards! Guards! 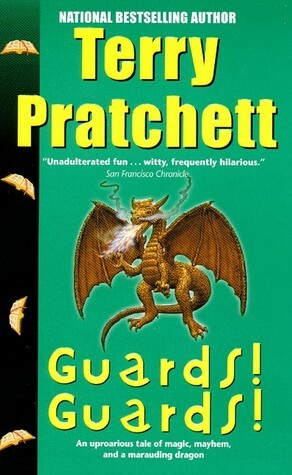 was my very first Terry Pratchet novel. He has multiple series that all gently interweave in the same setting and I was told this was a really good place to start. And I really liked the beginning of the book. It was fun to figure out the setting and it was actually really humorous which isn't something I normally go for it books. But in the first third of this novel it worked for me. I also loved the ending and the way all the stories wrapped up. My problem was with the middle of the book. I thought the whole novel could have been reduced in length by a third if a lot of the wasted time in the middle was cut out. It's just a pacing thing. Now I'm thinking about possibly reading more of Prachet's stuff. I just wonder if it's better paced than this book. I can tell there are a lot of things in his writing that I like, so I should probably give him at least another novel to try to hook me. I'm just not sure which novel of his I should read next.